Perlite is an ultralight pure inorganic material that is manufactured by taking an amorphous mineral formed in the process of concentration of the volatile content of magma as it is rapidly cooled while it flows in the ground water, lake or sea, grinding it to an appropriate grain size and then rapidly heating and inflating the grinded mineral at an extremely high temperature over 1,100℃. The plasticity inflation technique is the core part of perlite technology. Ultrafine hollow sphere manufactured using an industry-leading perlite plasticity inflation technology is widely used as caulking and sealing material thanks to its outstanding dispersibility, or as functional weight material for composite materials such as plastic to reduce product weight and improve the flame retardancy and insulation of a product, expanding the range of product use. The SiO2 contained in perlite is amorphous silica, which is harmless to the human body. Perlite is a mineral that is formed through the concentration of inner volatile content in the rhyolitic magma that erupts in the process of volcanic activity when the magma is cooled down as it flows in ground water, a lake or the sea. Unlike talc or vermiculite, perlite does not have any risk of being contaminated with asbestos, as it is completely different from serpentine minerals in terms of the location and process of its formation, and its chemical composition. According to the results of tests performed by a world-renowned analysis institution, there are no traces of the cancer-causing elements of crystalline silica or asbestos in perlite. Perlite (food additive) is also used as a filter aid (filtration, bleaching, deodorization, refinement) for the manufacture or processing of food. A stored sorted perlite ore(S11) by particle size is supplied one at a time and expanded(S21). Compared to the conventional manufacturing method, which expands the mixture of perlite ore by Particle size, this manufacturing process enables easy adjustment of the expansion rate depending on the intended use, and allows the operator to configure the optimal settings for the expansion process, such as the optimal flame temperature for each perlite ore particle by size. As a result, the perlite ore particles are expanded in a uniform manner, which is helpful for preventing their over-expansion or under-expansion. As above, the expanded perlite was expanded and stored by particle size temporarily(S31). The expanded perlite is mixed with a uniform ratio(S41) and packed for delivery(S51) when the order somes. As described above, the vertical arrangement according to the sequence of unit processes ensures a low crushing rate of materials during transfer, as materials are transferred between the processes by gravity. In addition, as each perlite ore is supplied in each expansion furnace and then expanded perlite grains are mixed according to the intended grain composition, the expansion settings for each perlite grain can be adjusted as required, which prevents their over-expansion or under-expansion, improving the final product quality. Expanded perlite can be used as lightweight aggregate, or can be processed to be manufactured into various products. Filter aid for beer, wine, etc. gas carrier, LNG carrier, etc. Expanded perlite is a natural glass, and is also known as pearl stone. It is formed when lava (volcanic lava) or magma cools down rapidly as it flows in a body of water such as a lake. Perlite generally has a vivid color, but some perlite has a bluish brown, blue or red color. Natural glass contains porous pumice, volcanic rocks and volcanic ash as well. Minerals that are generally referred to as perlite include obsidian, perlite and pitch stone, and such classification is based on their chemical composition (very similar), appearance and the amount of volatile components. Minerals with such characteristics are commonly referred to as perlite. In addition, perlite commonly refers to expanded perlite, which is expanded by treating it at a certain temperature. Perlite mineral is classified according to the content of volatile ingredients; notably, the ingredients of perlite minerals have almost no relationship with the kind of mineral, and its ingredients are similar to those of granite. The volatile content (generally water) in perlite is generally about 3 to 4% or higher. The relatively high amount of volatile content results from the continuous coagulation that occurs when the perlite is settling in the lake water. 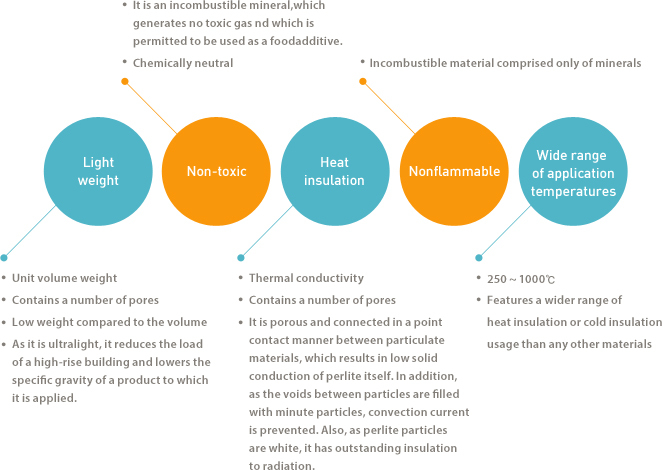 When heat (over 1,000℃) is applied to perlite ore with such property, the volatile content in the perlite gasifies and the inside of the softened particle inflates. As a result, internal pores are generated and those forming on surface of a particle are ejected to the outside, leading to the expansion of perlite by 10 to 20 times in size. This expansion causes expanded perlite to have an extremely light specific gravity, which is one of its major characteristics. Expanded perlite can have 3 shapes depending on the method and conditions of its expansion. These shapes are open cell, closed cell and balloon, each of which has different physical characteristics. OPEN CELL Expanded perlite can have 3 shapes depending on the method and conditions of its expansion. Closed cell perlite is useful for products for which absorption should be blocked out, and is appropriate to use in construction materials, heat or cold insulation materials. BALLOON Balloon is considered the centerpiece of perlite expansion technology, and refers to a hollow body product in which the cell expansion is induced to the maximum level, but which contains closed pores, like soap bubbles. Balloon perlite is produced by US-based Grefco, Sillbrico, and others. Balloon type perlite is a high value-added product, as it can overcome the limits of specific gravity, which is the biggest drawback of the existing ground powder type fillers. It is anticipated that it will grow remarkably in the filler market. There are currently only 4 companies in the world that have the technologies needed to produce all 3 of these types of perlite products. We hold proprietary technologies to produce all 3 types of perlite products thanks to our more than 10 years of technology development activities. As the importance of protecting the environment grows worldwide, concerns over the toxicity not only of asbestos but also of MMMF (Man Made Mineral Fibers) such as rock wool, glass wool, ceramic fibers, etc. are also increasing. As a result, the demand for environmentally harmless perlite, which can be used as a substitute for those toxic materials, is increasing not only in the domestic market but also in the international market, helping our company to make inroads into the existing asbestos and MMMF markets and providing an optimistic outlook regarding market growth.